As fun as it was testing different hot coffee makers, it was also a rigorous process. In the end, we singled out the Behmor 5393 Brazen Plus as the best coffee maker. Some of its features include customizable temperature control, a double-walled thermal carafe made of stainless steel, and the ability to presoak the grounds as well as to fully saturate them during brewing. Our step-up pick is the Bunn BT Velocity Brew. The best thing about is its speed – 4 to 10 cups within thirty minutes. It also has a double-wall, vacuum-insulated thermal carafe, a stainless steel internal hot water tank, an internal thermostat, and it is dishwasher-safe. Since not all can afford an expensive coffee maker, we had to come up with one that is affordable to all our readers. For our budget pick, we chose the Black & Decker DCM18S. It is a single-serve coffee maker, uses a permanent grounds filter, has auto shut-off, and comes with a 15-ounce stainless steel travel mug. Coffee is one of the most popular beverages in the world. While tea is a meditative drink, coffee is a go-getter’s beverage. It’s for the high-powered achiever. It drives you to do more. Considering how busy today’s world is, you need something that will save you time, a device that can make your drink quickly just before you dash out. That’s what you get with the best coffee machines. It brews the drink through a continual cycle of boiling or almost boiling the brew through the grounds using gravity until the beverage reaches the required strength. This is the percolation process. The method administers higher temperatures than other methods, making it prone to over-extraction. Enthusiasts praise the strong, rich beverage made by percolators. The single-serve or single cup method brews only a single cup at a time. The single cup coffee maker reduces brewing time and simplifies the process. They are the best for a person on a tight schedule. You will also find that a single serve coffee maker tends to be cheaper. This method involves pouring hot water on grounds. The resulting beverage is variously referred to as drip brewed, filtered, pour-over, or ground coffee. As the water seeps through the grounds, it absorbs the oils and essences and passes through the filter’s bottom. While the grounds remain in the filter, the drink drips into the carafe. Paper filters are seen as wasteful by some who instead prefer to use fine wire mesh filters which can give service for years. French Presses brew fast – one cup in two to four minutes. They consist of a cylinder-shaped beaker and a plunger. The plunger has a mesh piston which allows the liquid to flow through it while preventing the larger grounds from doing the same. It does better with coarsely ground beans than drip machines. It forces boiling water that is under pressure through the grounds and a filter. The result is a thick, concentrated beverage known as the espresso. Espressos are very popular in Italy (their birthplace) and the US. Espressos are used to make other sorts of drinks such Cappuccinos and Lattes. Cold brewing involves steeping grounds in water at cool temperatures for extended periods. You soak the coarse-ground beans in water for as long as 12 hours. The water remains at room temperature, though you may also use chilled water. You then filter the grounds of the water to give a concentrate that you dilute with water or milk and serve hot, over ice, or blended with ice or chocolate or something else. It is essential for coffee machines to reach and maintain the optimal water temperature of 198 to 205 degrees Fahrenheit (to be accurate: 197.6 to 204.8). We like our coffee hot, but if too hot or too cold, there will be an imbalanced flavor profile. You want a machine whose heater reaches the optimal temperature quickly and maintains it. Few of us have the time or patience to wait around for a slow coffee brewer. The faster the brewing process, the better we like it. This feeds into the busyness narrative. Since we are so busy, we would rather have a machine that makes our work easier, something easy to clean. We also want it dishwasher-safe. Ease of use encompasses a whole range of factors. A good example is when your machine has the automatic shut-off option or if it is programmable. This helps you conserve your time. Obviously, the more cups your coffee maker can extract, the better it is – unless it is a 1 cup coffee maker, which only does one cup at a time. Our best coffee maker is the Behmor 5393 Brazen Plus. It comes with customizable temperature control, which enables you to stay in control of brewing temperature, pre-soak time, and altitude. As a result, you can brew your cup of beverage with precision. Whatever your ideal extraction conditions and preferences are, you can actualize them with this coffee maker. This coffee maker also ensures accurate brewing within one degree of the set temperature. The temperature ranges between 190 and 210 degrees Fahrenheit. Temperature calibration is inclusive of elevation above sea level. You can presoak the grounds, setting the pre-soak time in the range between 15 seconds and 4 minutes. Presoaking the grounds in a small amount of water before brewing makes the drink bloom. Fully saturating the grounds makes for a terrific brew. The Brazen Plus has an oversized shower head with which it pulse-brews the water, creating turbulence in the grounds bed to completely saturate them. This is the best coffee maker for people with busy schedules. You can program it to make your beverage at a particular time. For instance, you can program it such that when you wake up or come home, you will find a freshly brewed carafe of your favorite beverage awaiting. It has a double-walled, stainless steel thermal carafe, which ensures your drink remains hot for longer. The carafe’s brew-through lid ensures heat is held in during brewing. Other features include a stainless steel water reservoir/heater, a flat-bottom filter basket with gold-tone permanent filter (rather than a paper filter), and an 8-cup brew capacity (that is 1.2 liters/40 ounces). We would have loved it more if it had a higher capacity. Eight cups are alright, but twelve would be better. Still, this is hardly a deal-breaker, and we wholeheartedly recommend this coffee maker. Our second-best coffee maker is the Bunn BT Velocity Brew. It can brew 4 to 10 cups (that is 20 to 50 ounces) in approximately thirty minutes. 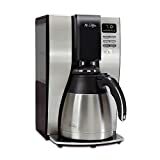 With such a speed, you can tell this 10 cup coffee maker is one of the best coffee makers for people on tight schedules. The coffee maker comes with a double-wall, vacuum-insulated thermal carafe that ensures your cup beverage will retain its warmth for up to 2 hours. The stainless steel internal hot water tank ensures the heater water stays in the optimal brewing temperature of 200 degrees Fahrenheit. The coffee maker has an 800-watt heater and an internal thermostat. Other features include a unique spray head which ensures even and complete flavor extraction, close-and-brew lid, and vacation switch. In addition, it is dishwasher-safe. You don’t have to spend a $100+ to get a good coffee maker for your home. For this best list to be complete, we wanted something that everyone can afford without feeling the pinch, and so we selected the Black & Decker DCM18S. It is a single-serve coffee maker, meaning it makes one cup at a time. It is fast and gives you no hassles, just the thing to incorporate in your busy morning routine. It uses a permanent grounds filter instead of relying on paper filters. Paper filters require replacement, but permanent filters do not, which means you cut unnecessary costs. It has a mesh metal filter which is easy to rinse clean. 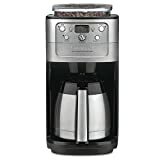 This best cheap coffee maker has an automatic shutoff feature which turns the machine off immediately after the brew coffee maker is done. This should give you peace of mind – you do not have to wait around when you start brewing. You can go out or continue with your chores, and come back later. It comes with a 15-ounce stainless steel travel mug, just the thing to take with you when you dash out. The travel mug is designed to fit in your car's cup holder. The coffee maker has a compact design that is ideal for small kitchens. Thermal carafes have a slow evaporation process that enables your drink to stay hot longer after brewing. So if you tend to wait for a while before pouring a drink for yourself or your guests, then a coffee maker with a thermal carafe (rather than an ordinary glass carafe) will serve you best. Our pick is the Mr. Coffee BVMC-PSTX91-RB. This brew coffee maker brews at a faster rate and a hotter temperature than most (205 degrees Fahrenheit). It also holds the temperature and fresh flavor of your cup of coffee longer. It uses a Gold Tone permanent filter, which eliminates paper filter cost and waste. The water reservoir is removable, making refilling an easier process. With water filtration, it removes almost 100% of chlorine, producing a better-tasting drink. With the Delay Brew feature, you can set brew time ahead. When you wake up, you will find your fresh-brewed beverage ready. It also has a Freshness Timer that monitors your drink’s freshness. For people who want the best-tasting beverage, machines with built-in grinders are the best option. A built-in coffee grinder enables you to grind the beans just before the coffee maker brews it, which results in a more flavorful cup of your favorite beverage. Our best coffee maker with built-in grinder is the Cuisinart DGB-900BC. 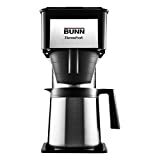 It has a built-in automatic burr grinder and an 8-ounce bean hopper which can accommodate a half pound of beans. The hopper has a sealed lid, preventing the entry of moisture. The grinder automatically grinds beans before brewing. It comes with a strength selector for choosing the strength of your drink, whether you want it strong, medium or mild. It also has a grind control to program the amount of beans you want to grind: from between 2 and 12 cups. This 12 cup coffee maker is probably the best programmable coffee maker on the market. With the Brew Pause feature, you can taste and enjoy a cup before the brewing process is through. This shuts off automatically after brewing. It also has a grind-off feature. The Cuisinart best coffee grinder comes with a charcoal water filter which helps remove impurities. The parts are BPA-free. Single-serve coffee makers are just the best if you are a polygamist where beverages are concerned. They allow a flexibility and range that other coffee makers don’t provide. With our best single-serve coffee maker, the Keurig K55/K-Classic, you can enjoy different types of drinks and flavors with greater ease. Since it only makes one cup at a time, you can always count on each cup you drink to be fresh. The machine allows you to brew multiple K-Cup pod sizes – they include 6, 8, and 10 ounces. The 6-ounce brew size should give you the strongest brew. It comes with 4 K-Cup coffee maker pods, a water filter handle, and 2 water-filters. The large water reservoir (48 ounces) enables you to brew 6+ cups before a refill is required. It’s a removable water reservoir, which makes refill easier. To conserve energy, you can use the auto-off feature to program the machine to turn off after being idle for two hours. The best machine for lovers of filter coffee is the drip coffee maker. The drip method is one of the most commonly used. Our best drip coffee maker is the Bonavita BV1900TS. It involves a one-touch brew coffee maker operation, and comes with auto-off. The best brewing temperature is between 195 and 205 degrees Fahrenheit. This machine’s 1500-watt heater can maintain that optimal temperature to make great-tasting drink. In addition, the machine’s flat-bottomed filter basket and large showerhead enable improved saturation and uniform extraction. This results in an optimal flavor profile. If you hate all the work involved in cleanup as do we all, you will be happy to know that the carafe lid, the filter basket, and the showerhead are all dishwasher-safe. All the plastic parts are BPA-free. French press coffee makers are the best option for people who like their beverage strong and ready in a short time. We awarded the best title in this category to the very affordable SterlingPro Classic European Style. This coffee maker has a double-wall construction that ensures your drink remains warm for longer. The design also keeps the outside surface cool to the touch. The coffee maker is made of stainless steel, both its interior and exterior. This means that it is not prone to rusting. With this 8 cup coffee maker, you can brew a liter (which is approximately 8 cups or 4 mugs) of the best-tasting drink. It is an excellent gift for a friend – what with the mirror finish and stylish design. It will look stunning in your kitchen. As a coffee lover, an espresso machine is one of the best investments you can make. Espressos are made by putting nearly boiling water under pressure and forcing it through ground beans. One of the best things about the espresso is that you can use it as a base to make cappuccinos, caffè mocha, caffè latte, flat white, caffè macchiato, and caffè Americano. In our estimation, the best espresso maker to help you do all this is the DeLonghi EC155M Manual Espresso Machine. The top, control panel and dip tray of the DeLonghi EC155M are all made of metal, while the boiler is made of stainless steel. This means you can count on its durability. If you love your cappuccino, then this is the best coffee maker for you. It has what is known as a Cappuccino System. The system mixes milk, steam, air, and steam to produce a rich, creamy froth that is excellent for making cappuccinos. Thanks to its self-priming system, this machine is always ready for use. The hot coffee maker comes with two thermostats that help you control the water and steam temperatures. Other attractive features include a single selector knob for on/off, a removable drip-tray, a transparent water reservoir that can hold up to 1 liter, adjustable steam emission, an anti-drip system and removable water tank that is dishwasher safe and easy to clean. For the old school, a percolator is one of the best coffee makers you can invest in. They are a slower, more traditional way of brewing. 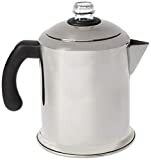 Our best percolator coffee maker is the Farberware Classic Percolator. Percolators use different heat sources. The Farberware classic is a stovetop. It comprises heavy-duty stainless steel which is polished to a mirror finish, giving a classic touch that that looks good in any kitchen. A plastic knob will let you know when percolating begins. Percolation is a process by which a solvent (in this case, hot water) gradually passes through a permeable substance (in this case, the grounds). The coffee brewing machine comes with a permanent filter basket, eliminating the hassle of dealing with messy paper filters and the waste/cost associated with them. It also has a non-reactive interior, which ensures the water does not absorb any undesirable odors or tastes that would ruin your drink. The percolator is fully immersible and dishwasher-safe. Coffee makers abound in the market. Some we chose to exclude because of their exorbitant prices, with some going for over a $1000. Others that we feel fall short of our standard are those that drip brew slowly, fall apart easily, are a pain to clean, waste too much of your time, or are not worth the price they go for. We also like the Technivorm Moccamaster, Hamilton Beach and Cuisinart coffee maker models. Cuisinart and Hamilton Beach are some of the more experienced makers in the market and the impressive line of Cuisinart and Hamilton Beach Brewstation products speak for it. Q: Paper filters vs. permanent filters – which are better? A: Paper filters are disposable. They are made of crepe paper. They are the best choice if you want to make your beverage quick without having to bother with a lot of cleaning afterward. After you are done brewing, remove the filter and discard it. However, they are not environmentally friendly. Though they are biodegradable, there is no denying that all that waste won’t have the best impact on our environment. It is easy to argue that permanent filters are the best option. Paper filters are of two types: bleached or unbleached. Bleached filters are whitened using chlorine or oxygen. Bleached filters do not change the taste of your drink. Oxygen-bleached filters are better for the environment than the chlorine-bleached. Unbleached filters do not have that bright white color the bleached ones have, and are a bit better for the environment because they require less processing. However, they are more likely to give your drink a papery taste. The best thing about permanent filters is that there is no endless hassle to keep replacing them. Simply wash and reuse. You save a lot of money over time. Cheaper reusable filters are made out of nylon. The best ones are the gold-tone filters, which are made out of gold. Q: How do I get rid of the papery taste caused by my paper filter? 1. Place the filter in the coffee maker. 2. Pour hot water over the filter to pre-wet it. Ensure you cover every inch of the filter. 3. Get rid of the water. 4. If you think it is necessary, rinse the filter a second time. 6. If you still get that papery taste, try another brand. Q: Are there brewing best practices? 1. After each use, clean your equipment – cup, grinders, filters, and coffee makers. To rinse, use clear, hot water, wiping down thoroughly. Use an absorbent towel to dry. Ensure no coffee grounds remain – a buildup of caffeol (coffee oil) will give your beverage a bitter taste. -Country and region of the beans’ origin. -Type/variety of bean – arabica, robusta, or a blend. 3. For the best quality, buy your beans freshly roasted. Buy in small quantities – every one or two weeks. 4. Don’t reuse coffee grounds. During brewing, the best flavors are extracted, leaving only the bitter ones. 5. For whole bean, grind just before brew time to get the best freshness. 6. Use only the best water as this will affect the beverage’s quality. If your tap water contains chlorine, or if it has a strong odor or taste, use filter or bottled water. Let the tap water run a few seconds. Cold water is best. Don’t use distilled or softened water. 7. The golden ratio of coffee to water is one to two tablespoons of ground beans for every six ounces of water. Adjust to fit your tastes. Keep in mind that some water will be lost to evaporation in some brewing methods. 8. The optimum water temperature for brewing a cup of coffee is between 195 and 205 degrees Fahrenheit. If the water is too cool, you will get a flat, under-extracted beverage. When too hot, the taste will lose some of its quality. This does not matter if you are using the cold brew method with a cold brew coffee maker. If brewing manually, allow the water to come to a full boil without over-boiling. Turn off the heat, and give the water a moment to rest before pouring it over the coffee grounds. 9. How long should the water stay in contact with the grounds? Note that this will affect the flavor. It depends on the brew method. For instance, the drip method has an optimal time of approximately 5 minutes. If using a French Press, let the contact time be 2 to 4 minutes. The briefest contact time is that of espressos – 20 to 30 seconds. The cold brew method has the longest – steeping overnight, it takes about 12 hours. If the taste displeases you, it means you are over-extracting (excess brew time) or under-extracting (insufficient brew time). Experiment to discover the brew time that satisfies your taste. Get the best automatic coffee maker or best thermal coffee maker to experiment with this at home. Q: How do I store my beans? 1. Store in an airtight and cool location – Four things are bad for your beans: moisture, heat, light, and air. Storing them in an opaque, airtight container at room temperature will help preserve their fresh roasted flavor. Don’t use clear canisters which let light in as the light will compromise the taste. The storage location should be dark and cool. Don’t store them near the oven. Don’t keep them on the kitchen counter where they can get acted on by strong sun. If possible, get storage canisters that have airtight seals. 2. Purchase the appropriate amount – Instead of buying large batches of freshly roasted beans, purchase smaller batches with more frequency. Buy beans that will last one or two weeks. The reason for this caution is that the beans begins to lose freshness after roasting. 3. Don’t freeze your beans – Coffee absorbs moisture, odors, and tastes from the air in its environment. This is one of the main reasons why you should not refrigerate it. Many home storage containers allow small amounts of oxygen to come in, which is what causes freezer burn for foods stored a long time. If you decide to freeze/refrigerate your beans, ensure you use an airtight container. Q: How do I get the best quality out of my beans/brew? 1. Always clean your brewing equipment after use. Otherwise, oils and particles will coat the equipment, causing a bitter taste to transfer from the dirty equipment into your brew. 2. Ensure your water is neutral, and at the right temperature and volume. It should not have any unpleasant odors or flavors. Heat it to an optimum temperature of 195 to 205 degrees Fahrenheit. 3. Ensure the coffee beans are freshly roasted, since roasted coffee is highly perishable. Store it as directed above – in a cool, dry location, sheltered from moisture, heat, light, and strong odors. Whole beans will retain optimum freshness for two weeks. Ground beans can only do an hour or less in an ambient environment (the increase in surface areas quickens the process). 4. Match the grind-type to the brewing technique. If you are using short methods like the espresso brew, use fine-ground coffee beans as it will ensure fast extraction. If you are using methods with longer brew time like the French Press, use coarsely ground beans. 5. After brewing, the beverage is highly perishable. Serve immediately in a carafe after you are done brewing. Don’t let it sit in a glass carafe for more than 30 minutes. And if it is a thermal sealed carafe, give it at most 60 minutes. Long holding time allows the dissipation of aromatics, which reduces the drink’s sweetness and acidity. Meanwhile, the solubles continue cooking in the brew, and what ensues is a flat, bitter brew. Q: How should I clean my coffee maker? 1. Disassemble the machine, removing any parts that can come off – like the pot, brew basket, and so forth. Removable parts should be cleaned separately from the rest of the machine. 2. Wash removable parts. Submerge them in warm, soapy water and wash with a dish rag. Remember that glass pots are fragile, so treat the glass with care. Consult the instruction manual to find out which parts are dishwasher-safe. To be on the safe side, don’t use the dishwasher unless you are certain those parts are dishwasher-safe. 3. Use a wet, soapy rag to wipe down the outside of the machine. Remove any grinds from the warming plate. Finally, wipe off soap suds using a clean, damp rag. 4. After all parts have dried, reassemble the machine. Q: What if I want to deep-clean it? 1. Take half water and half white vinegar to make a mixture. How much of this mixture you should make depends on the size of your machine – enough to fill the reservoir, where you should pour the mixture. 2. Turn on the machine, letting it run half a brew cycle. When half the pot is full with the mixture, turn off the machine. 3. Give the machine an hour to just sit. Set a timer. During this time, the vinegar will clean out any mold in the machine. 4. After the hour is over, turn the machine on. Allow it to complete the brew cycle. In the end, the entire vinegar/water mixture should fill the pot. Pour it down the sink. 5. Pour clean water into the reservoir and run a complete brew cycle. Pour out the water, and then run another brew cycle with clean water. You are cleaning the vinegar out of the machine. 6. Use a damp, clean piece of cloth to wipe down the machine’s exterior. Remove grinds from the warming plate. Q: Is there anything else I can do other than cleaning to ensure my machine remains in good condition? 1. Read the manual. It will give you instructions on the particular methods which the manufacturer allows for cleaning and maintenance of the machine. 2. Don’t close the reservoir lid. Many people keep it closed. Leave it open when not in use. Doing so will dry out the machine, which prevents the growth of mold and bacteria – they fester in moist environments. 3. Rinse the brew basket in the sink regularly. The brew basket is prone to the growth of mold since it gets wet during brewing. Rinse it out after use as well cleaning it each time you are doing dishes. Doing so will ensure the machine is mold and germ-free. Q: I know nothing about grinders. A: There are two main types: burr and blade grinders. Blade grinders have a double-pronged blade at the bottom of a chamber, which spins at rapid speed, chopping up the beans. When the blade hits the beans, they blast into different-sized pieces, with the fine grounds falling to the bottom of the chamber where the blade chops them all over again. The big grounds (known as boulders) stay towards the top, and sometimes get hit by the blade. Blade grinders produce grounds of all shapes and sizes. Since differently-sized grounds will brew at different rates, the resultant drink is likely to be unbalanced and disappointing. The rapid spinning of the blade also produces heat that can compromise the flavor of your grounds. Blade grinders are usually cheaply made, and not very durable. You cannot control them – you can’t choose grind size. The best thing about them is ease of use – all you do is press one button. They are also easily accessible and cheap (costing less than $20). Burr grinders are different. They have two burr pieces which funnel the beans through the grinding area. It grinds them to a uniform size. Uniformly-sized beans have similar extraction rates, and produce a balanced beverage. Most burrs are made of stainless steel or ceramic. They last longer than cheap metal blades. The grinding process creates little heat, and leaves the flavors intact. If you want to adjust the size of the grounds, you can move burrs closer or farther apart. That means the beans you grind with this type of grinder will work well with any coffee maker. Using the burr grinder for the first time is a revelation. It opens a new world of flavors and variety to you. Q: How do I get rid of old grounds in a useful manner? 1. As a pest repellent – If you sprinkle the grounds around your plants, they will give protection against ants, snails, and slugs. 2. Use to fertilize your garden – Grounds are good for roses, camellias, hydrangeas, rhododendrons, and other acid-loving plants. Mix the old grounds with brown leaves, dead grass clippings, or straw to neutralize some of the acidity, and then spread around the plants. Used coffee grounds enrich the soil with potassium and nitrogen. They also add magnesium. 3. Use as compost – If you don’t want to use them as a fertilizer yet, throw them on the compost heap. Grounds are good “green” matter due to their rich nitrogen content. They may also attract beneficial worms to the compost. 4. As an odor eliminator – Spread the grounds out on a baking sheet, and give them time to dry. Put them in a bowl. Place around the house. They will neutralize odors. You can have a bowl of grounds near the sink to dip your hands into after chopping garlic or onions – they will help remove that onion smell from your hands. 5. To make soap – Melt a bar of glycerin soap. Add 1/3 cup of grounds. Reshape the mixture into a bar using a soap mold. 6. To repair/disguise scratched furniture – Mix a tablespoon of grounds with a teaspoon of olive oil. Use a cotton ball to apply the mixture to the scratched surface. Wipe dry. Test on a small area first. 7. Cooking – You can add them to marinades to give meat a unique flavor and to tenderize it. You can also add them to chili and to chocolate cake as a flavor enhancer. Q: How much caffeine does my coffee contain? A: This table will give you an idea of how much caffeine you are consuming in your drinks. Our best pick is the Behmor 5393 Brazen Plus, which we admired because of its customizable temperature control and double-walled, stainless steel thermal carafe. We also liked that it enables you to presoak the grounds, and to fully saturate them when brewing. this is a great article! 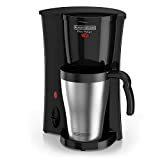 I especially like the Hamilton Beach 49980A Single Serve Coffee Brewer Coffee Maker mostly because of coffee to go function and bargain price 🙂 Have you got a favorite one, you can personally recommend for 2 coffee lovers? Wow! great post it helps me a lot.Thanks for the wealth of information.